Haste Theatre » Haste visits Edinburgh! Recently, 3 of Haste Theatre departed for Edinburgh Festival for a few days to meet up with the producers of the festivals we have been to this summer: Kevin Patterson – San Diego, Davide Ambrogi – Roma and Michael Marinaccio – Orlando Fringe; to network, see some shows, soak up the atmosphere and spread the Haste word! 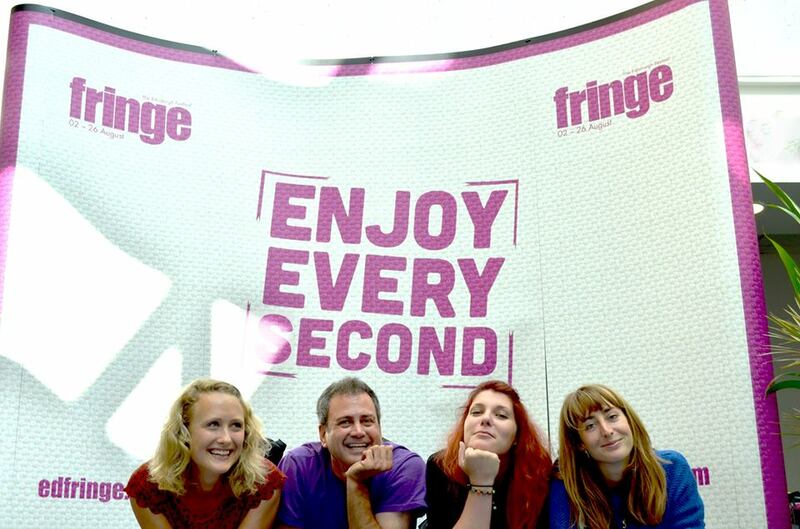 After uncrumpling ourselves from a long night bus we hit the Pleasance where we met Davide, Michael and Kevin as well as Holly Payton-Lambardo and Catherine Mattos who run the World Fringe Network. Holly and Catherine were animated and informative and invited us not only to drinks in the private bar for industry professionals that evening, but also to the promoters’ breakfast, where artists have the chance to network and meet promoters, producers and agents! The World Fringe Network had also set up a panel which we were invited to speak on. After a great festival Mexican lunch, we saw a brilliant one-woman show, ‘The Veil’ by Lucy Hopkins. That evening we went for drinks at the industry professionals’ bar in the famous Udderbelly where we met more fringe festival producers. Great to be there as artists having a good time chatting, meeting such interesting people and representing Haste to the industry. In the morning we sat in on the producers’ panel where producers answered questions on their fringes and the ways they are run. This gave us a great insight into the world of fringe and a greater depth of knowledge which will inform the planning for our next tour. It also gave us the chance to see the people we had met the previous night in action, talking about the great work they do! We spent the next part of the day helping Kevin at the Fringe Fair, acting as ambassadors for the San Diego and Roma festivals, answering artists’ questions about our experiences and making lots of interesting connections. The next day we went to the promoters’ breakfast, feeling a little cheeky as it was for Edinburgh artists, but as part of the World Fringe Network panel we were welcomed. A picture board informed artists which professionals were there and after a mouthful of fruit cocktail we got chatting to an international tour promoter and the director of a Polish theatre , both of whom we had targeted to see what they were all about. The breakfast was a buzz of chattering, promoting and networking, a great way to get our name known in the industry! Mid-day, and time for the panel which consisted of 6 artists from the U.S, England and Canada all of whom had performed at a variety of Fringe Festivals around the world. The questions were led by Holly of the World Fringe Network. The big audience consisted largely of Edinburgh artists as well as some producers and industry professionals keen to get an artist’s insight into Fringe. After feeling cool, calm and collected at the promoters’ breakfast, I began to feel a little nervous as the first question was asked, but as soon as the ball got rolling we began to enjoy ourselves, listening to the experiences of different artists at varying stages in their careers. It was also great to have a platform for our own tales from San Diego, Roma and Camden, giving an account of the performances, audiences, locations and organisations we have been working with this summer. We were also able to convey our ideas about the benefits for emerging international artists of performing at the newer Fringe festivals in gaining reviews and press exposure. Hearing about Canadian and other U.S Fringes gave us useful (and exciting!) first- hand information to use in planning next summer’s tour. After a fun and tasty lunch with ‘the producers’ listening to stories and pearls of theatre wisdom, we went to a show called Repertory Theatre by Elephant and the Mouse (tickets kindly donated to us by the company!) to see a manic 2 man whirlwind show full of Shakespeare satire, energy, comedy and a lot of spit! On our last day at the festival we again met up with Kevin, who told us that in San Diego they have little, perhaps no European Physical Theatre and so was very eager to see some. We were also keen for him to see the sort of work that inspires us and that we love to experience as audience members. First stop was ‘Missing’ by Gecko Theatre. This was a dark and imaginative piece using conveyor belts, lights, simply constructed frames through which the protagonist saw memories. The fantastic gestural ensemble and solo movement left us all completely inspired. The second piece we saw left us less inspired but it was interesting in its own right, filled with true and horrific stories of capital punishment, torture and unjust killings told through some beautiful imagery and at points less than inspiring cookery metaphors. We sadly said goodbye to Kevin later that afternoon but with the promise that we would see him next year with an even better show. Thank you, Kevin for the shows, advice, fun and promotion all weekend! A big thank you to Michael and Davide too for great company and advice all weekend and a special thanks to Holly and Catherine for giving us the opportunity to talk on the panel and getting us out and about with industry pros at various events each day! Throughout our time in the land of crazy and often somewhat lacklustre flyering and performances we stayed with various members of the lovely Dupre family who gave us great hospitality and a lot of fun too. All in all a very productive and enjoyable few days at the festival and we weren’t even performing! Who knows what will happen same time next year, watch this space…!